This week we launched our FED Stories events in Sydney and Canberra. Based loosely on the well-known “TED Talks”, FED Stories are intended to be regional gatherings where participants hear stories of congregational practices in relation to formation, education and discipleship and then engage in conversation. In the midst of the seemingly perennial discussion of church property, finance, membership and other crises, here’s an opportunity to focus on some matters that are at the heart of being a community of disciples of Jesus Christ. 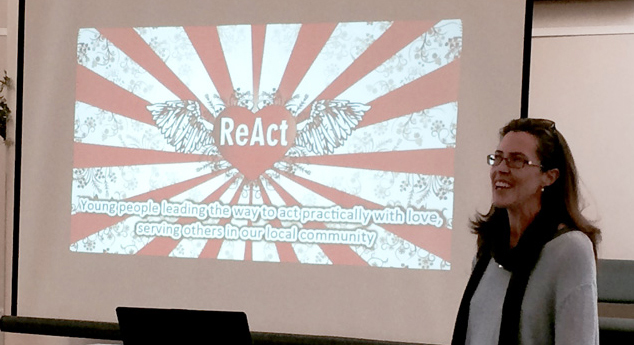 At Turramurra UC, Fiona Blair told the story of ReAct, a reinvention of the annual youth camp of Pittwater UC around service and faith-sharing, a residential weekend in a local youth hostel and a range of service activities. Chris Goringe from St John’s Wahroonga UC reflected on the development of “The Growing Place“, a weekly Sunday evening family gathering for worship, friendship and food, and the idea of a “Jesus Dojo” – disciplined teaching and practice (idea courtesy of Mark Scandrette from the animate: faith video series). Chris’ Prezi presentation is here. Jon Humphries (aka Uniting Change) shared insights from the model/framework/approach to discipleship that he has been developing. Thanks to Jon Humphries for organising and promoting this event. In the FED Stories event at Kippax UC, Anne Ryan (from Tuggeranong UC) talked about ways in which she has engaged adults in teaching and learning the faith, and encouraged ministers to pass on their learnings to their congregations. Hannah Dungan from Kippax provided an overview of Search Institute‘s 40 developmental assets for young people and shared an example of how the assets shaped a particular ministry event. Jennifer Pickard used Godly Play method creatively to explore the spirituality of children. Finally, I gave a brief overview of the Assembly emphases in formation, education and discipleship, and showed a segment of the video interview with Ian Hickingbotham from North Ringwood UC in Melbourne talking about their School of Ministry and his approach to leadership. Thanks to Hannah Dungan and Gordon Ramsay for organising and promoting this event. At each event I displayed a range of resource exploring teaching and learning, discipleship and faith formation. These were great launch events and we look forward to more of them. If you’d like to learn more and maybe host a FED Stories event, click here for more information. FED Stories Intro from Craig Mitchell on Vimeo. How do faith communities foster lifelong growth in faith and discipleship? FED Stories is an opportunity for leaders to listen to and learn from one another in an environment of mutual encouragement and shared discovery. The new Assembly Formation, Education and Discipleship unit invites congregations and presbyteries to host regional FED Stories events – half-day or evening gatherings where local stories are shared about activities, groups or processes that are bearing fruit in forming disciples of Jesus Christ. We believe that as a church we can learn from each others’ experiences and experiments, from long-held wisdom and from risk-taking adventure. “FED stories” is an initiative of the UCA Assembly to foster conversation about formation, education and discipleship across the Uniting Church. Based loosely on the well-known “TED Talks”, FED Stories are intended to be regional gatherings where participants hear stories of congregational practices in relation to formation, education and discipleship.